Black is back. Black garlic. Buah keluak. Squid ink. Charcoal. Of course, Malaysians have always been using the thick dark soy sauce for many home dishes. I will share a recipe here which is simple and underlines the principle that sometimes less is more. I did not made an effort to take some proper photos. And so I only have one taken which looks rather unappetising. I will get a new one up the next time I cook this. However, I can tell you that this is very delicious. In this recipe, garlic is the key ingredient. The idea is to "slow and low" braised it until the flesh of the garlic meld into the thick sauce. Tough cuts of pork meat like trotters, pork ribs, shoulder or belly is suitable for this slow-braise recipe. Check out on this link for more info on the slow and low cooking technique. 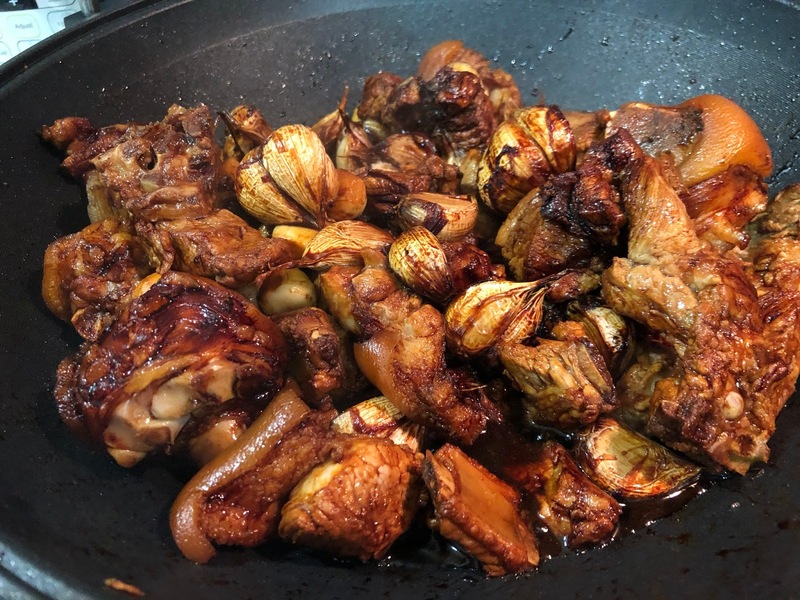 I won't fuss about the kind of garlic you should use but just make sure you are using the dark caramelised soy sauce with is common in Malaysia. You can choose to peel the garlic or leave the skin on. 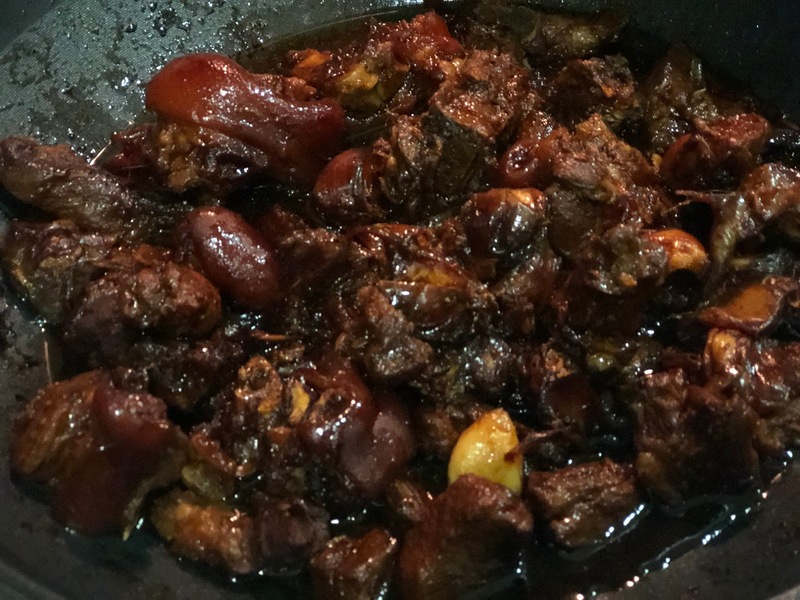 This recipe focuses on the flavours of the garlic, pork and dark sauce. Herbs (i.e. aniseed, cinnamon bark, orange peel) are not necessary unless the pork has a strong off-putting taste. You are probably familiar with pork trotters in black vinegar (chi kook chao), which I also love. This recipe is just another way of enjoying the trotters. This is how it looks like when you begin to braise it. Note that I added some pork ribs. Get the butcher to cut up the pork trotters. Blanch the trotters in hot boiling water for about 10 minutes and remove. In a wok or pot, add the sauces and when it is hot, add the trotters. Add the sugar. After 10 minutes, lower the fire and let it simmer for about one and a half hours or till it is cooked. When cooked, you should be able to pierce the fat with a fork easily. The pieces should not be falling apart as this means that it is overcooked. This dish keeps well. Reheat before serving and eat with white rice. Garnish it with some coriander leaves. Pair it with a plate of green vegetables. There is no need to add the usual braised spices like star anise, cloves and others? Can I use the same measurements if I want to add taupok and eggs? Thank you.